As long as I can remember I’ve loved to read. I can remember reading Hardy Boy books way back when they were almost as big as me. This was instilled and reinforced I’m sure by the travelling Bookmobile from the Newfoundland Public Libraries. I think there was a library in Clarenville when I was a boy, perhaps in the fire station building? I forget for sure, but most of my reading came from the bookmobile. These travelling libraries used to come to some rural towns back in those days, perhaps most, I really have no idea, but I remember it fondly. Many a Hardy Boy adventure, and lesser known adventures such as Alfred Hitchcock and the Three Investigators, Tom Swift, and quite a collection of English kids books by Enid Blyton (anyone else read Five Find-Outers and Dog?) were inhaled voraciously by me. I am also pretty sure I first read one of the first sci-fi fantasy books I ever read from here, that being A Wrinkle in Time by Madeleine L’Engle. 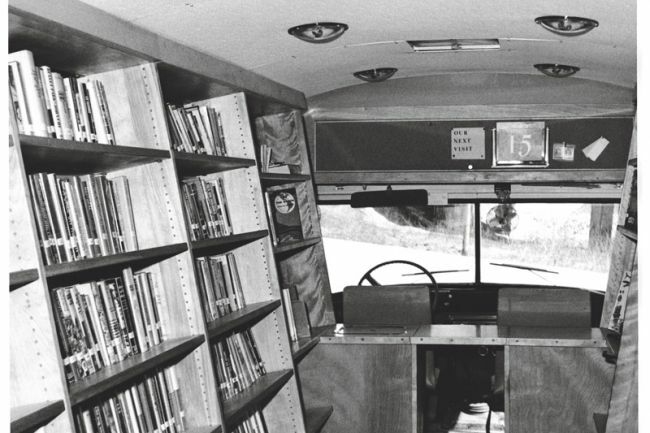 I still love to read to this day, and will always remember the smell of books in that little mini-bus, the walls filled, a desk installed behind the driver so he could just spin a chair round and stamp the little pocket at the back. Was an event and treat to see that bus come down over the hill and run out to wait for the doors to open. If anyone has any pictures of it, or recollections to add, let me know! I was the first bookmobile librarian for the Clarenville area back in 1972. I worked with Marvin Pitts who drove the bus and along with me helped the people choose their books or requested things for them St. John’s. It was my first full time job and I loved it and loved meeting the people, children and adults who came to get their reading fix, so long ago. My brother, James Pottle, was the principal of the Random Island School and his wife Jeannette taught there too. It’s been a long time and I am now a retired public and school librarian (much of my library career was in Calgary) living in beautiful Vancouver, BC, but I always remember the time I spent in the area providing library services from our mobile library. I lived in Shoal Harbour for part of the time and my view included Random Island where, of course, I also spent time visiting my brother and his family. Marvin became the librarian of the Clarenville library and may well have finished his career there. Thanks for your memory! I definitely remember Marvin, though till you said his name I had forgotten it. Jim is a friend of mine, both from school days and since. Nice to hear from you.